We'll use this to send you your tickets. Groups of 20 or more people attending the same date and showtime, please call 818-845-3110. Every effort will be made to seat the group together based on availability at time of purchase. Voucher or promo codes must be entered at time of purchase and are not valid for previously purchased tickets. All dates and showtimes subject to change without notice. All sales are final. Tickets purchased are for date and time purchased; no exhanges or refunds. Got a ticket voucher or promo code? If you do not wish to purchase tickets, just click continue. To purchase Experience Add-Ons for your booking, please first select the time you would like to attend. There is an additional charge for experience tickets. To select different seats, make your selections on the map. All seats are reserved. Accessible Seating: The El Capitan Theatre offers accessible seating (as well as Companion Seating) on our Orchestra Level. There is no elevator at the El Capitan Theatre for Balcony Level Seating; this is only accessible via stairs. 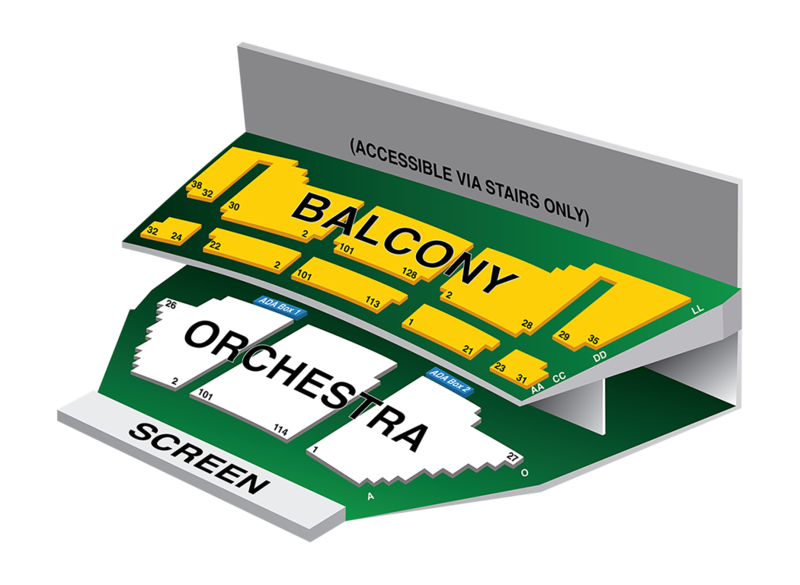 To purchase accessible seating, select Orchestra Right or Orchestra Left seats that are blue. VIP Sections vary by performance and may have Reserved seats available on the day of your show. Accessible seating is available on the Orchestra level. There is no elevator at the El Capitan Theatre for Balcony Level Seating; this level is only accessible via stairs. Please complete all of the following information to make your payment using any of the displayed credit or debit cards. I understand and agree that all sales are final. There are no refunds or exchanges. Tickets are only good for show date and time purchased. Thank you for booking with El Capitan Theatre. Details of your booking are below. You will receive an email containing all of these details, as well as your e-tickets at the email address below. Removing this booking will cancel this order. Are you sure you would like to remove this booking? It appears that you already have this film in your basket. Would you like to complete this order? If you update your email address you will need to restart your order. If you exit now you will lose your booking. Do you wish to leave and lose your booking? This space is reserved for wheelchair use only and does not have a seat. This wheelchair space and the seat adjacent to it are reserved for a patron using a wheelchair and their companion only. Would you like to continue with this selection? This is a priority seat for companions of guests using the wheelchair space. If this seat is required by the companion, you will be asked to move. There has been an issue with the seats you have selected. Please select new seats and try again or call 1-800-Disney6 for further assistance. There are no longer seats available. Please choose another day or showtime that may have tickets available. For further assistance, please call 1-800-DISNEY6. You are about to leave booking! This booking has not been added to your cart. Would you like to leave this booking? Child tickets may only be booked when an adult or senior ticket has been selected.